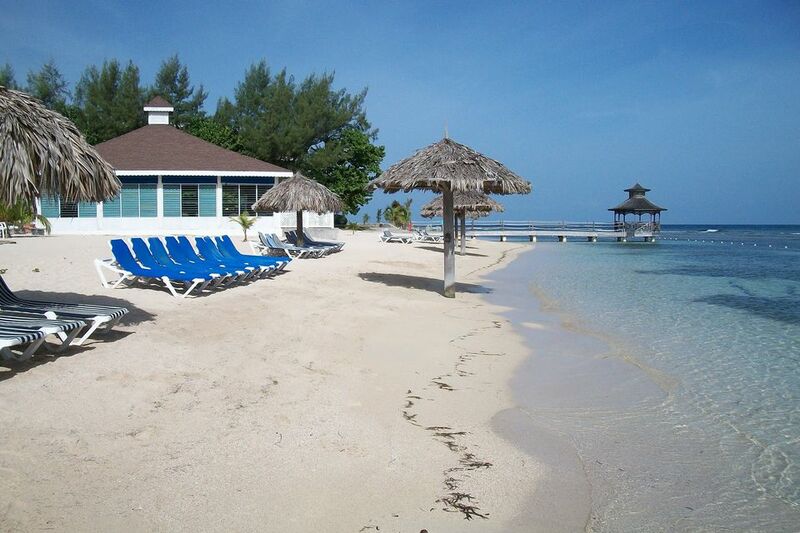 The Holiday Inn Sunspree Resort in Montego Bay is an all-inclusive resort that, with seasonal rates as low as $75 per person per night, offers a great value and even some pleasant surprises that top the offerings at other, more expensive hotels. There are a lot of great beach bars in Jamaica, but you could do a lot worse than spending an afternoon at the Jerk Bar at the Holiday Inn Sunspree Resort in Montego Bay. Cold draft Red Stripe, cocktails mixed with Appleton Estate rum, and all-you-can-eat hot, fresh jerk chicken and pork, with seats hanging over the edge of the Caribbean—what’s not to like? If you're thinking of a long weekend in Jamaica with the kids that doesn't set you back too much cash but delivers all of the Caribbean vacation basics, we'd recommend the Holiday Inn Sunspree Resort in Montego Bay. If you're from the U.S., you're familiar with the Holiday Inn name, which may not necessarily scream "Caribbean vacation" to you. But this property delivers the "good" of Holiday Inn—excellent value and good-quality amenities—and is far from the roadside hotel experience you'd expect back home. With a direct flight to MoBay's Sangster International Airport (MBJ) from many East Coast airports and just a 10-minute drive from the airport to hotel, you can get here quick. And once at this 518-room, 27-suite resort, you'll find a diverse array of entertainment and activities in a safe, kid-friendly environment. All guest rooms at the Holiday Inn Montego Bay have been upgraded as part of an ongoing renovation project. The spacious suite was dressed in neutral colors, with french doors connecting the bedroom to the living room, both with flat-panel TVs so you can put the kids on the pullout couch and still maintain some privacy for parents. Each room has an ocean view balcony, although the one in the living room was partially obstructed by the room of the kids’ club a floor below. The spacious work desk in the living room was a nice touch, as was the free (and relatively fast) wifi in the rooms. Bedding was comfortable, if not plush—this was one area where perhaps the Holiday Inn pedigree shows through a bit too much. A simple curtain separated the bedroom from the bath, but fortunately, the shower and commode were tucked behind a solid door. Two sinks were set in a rose marble counter, and the jetted tub was small but serviceable. Hot water was unavailable the first morning of our stay, but apparently, this problem was solved by day two. For families traveling with younger children, the Holiday Inn not only lets kids 12 and under stay free with parents but also offers a number of special KidSuite family rooms with really cool bunk beds. These studio accommodations may not leave much room for romance, but at least the kids' area is walled off like a cubicle with its own TV and play spaces. Children also eat free at the resort, and access to the kids' club is included in the price of your stay. Most meals at the resort are taken at the main restaurant, the Portside Buffet. Decor here is a step above the norm, with some pretty cool Ikea-like seating and bright Caribbean colors added to the sunlight pouring in from the adjacent pool deck. Offerings were about evenly split between Jamaican and American/international cuisine. There were long lines at breakfast for the omelet bar, and the chafing-dish eggs seemed pretty runny, so you may want to opt for the local choices—tasty ackee and saltfish alongside some fresh tropical fruit. (There were also braised beans and stewed cabbage if you're feeling adventurous.) The French toast and bacon were also fine. Dinner at Portside was similar, with the jerk meats and other island favorites more appealing than the pizza bar. There’s nothing here that will blow you away from a culinary perspective, but certainly, the food quality was more than acceptable. Lunch and late-night snacks at the Barefoot Bar and Grill was a mixed bag: the burgers were high-school-cafeteria quality (that’s not a compliment), but the fries were hot and tasty, and it’s hard to mess up grilled cheese and hot dogs. Fish and chips also were served—frozen fish wedges dropped into the Fry-o-lator—but we didn’t try these. For casual food, you really couldn’t beat the jerk chicken and pork at the nearby Jerk Bar, so combining the jerk with some hot fries might be the best way to go. We also liked the high-quality ice cream served from a stand near the kids club, which also offered other snacky food for the little ones. The so-called “specialty restaurants” at all-inclusive hotels are sometimes a sham—just separate themed rooms being served out of a common kitchen. Not so at Sorrento, the Holiday Inn’s Italian eatery, which was the nicest dining surprise at the hotel. Out of a big, open “show” kitchen came some nice appetizers (fried ravioli, meaty crab cakes), a very good Caesar salad with a well-balanced anchovy dressing, and an excellent beef tenderloin and seafood pasta. Wine service was limited and uneven—the chardonnay basically undrinkable, the Merlot quite passable alongside the beef. You’re never too far from a bar at the Holiday Inn Sunspree—watering holes are located in the main lobby, by both pools, along the beachfront, and, at night, in the Port Royal room, upstairs along an elegant lobby promenade. We very much appreciated the selection of top-shelf liquor used in the mixed drinks. Be warned: those rum cocktails are made with Wray and Nephew overproof rum, which definitely has a firm kick. But you also can order your drinks made with Appleton’s for a smoother ride. We especially enjoyed the evening ambiance (and air-conditioned) in the Port Royal, an intimately clubby space with big couches and flat-screen TVs showing soccer and other sports. There are live music performances on a stage near the main pool (also the centerpiece for poolside activities during the day), music at the Port Royal, and even a pocket-sized casino with a few dozen electronic slots and video poker games. Kayaks, pedal boats, and Hobie cats (the latter crewed for your safety) are among the water sports available to hotel guests, along with the usual snorkeling equipment and other water toys. One thing the Holiday Inn really lacks is a good beach—there’s a decent strand at the quiet east end of the property, but the beaches in front of the rooms are merely small, half-circles of sand protected by jettys, and the seagrass on the bottom makes for a rather unpleasant barefoot walking experience. The best beach is right in front of the lobby—a lagoon created by an artificial, crescent-shaped island that you can wade out to through smooth, clean sand. As with all the beaches here, there’s little in the way of surf or current, making it ideal for guests with children. Despite being just a few hundred feet offshore, the island actually provides a quiet sanctuary for those who want to sunbathe or read a book in peace, and at night you’ll probably have the island beach chairs to yourself. If you’re an early riser you may enjoy playing tennis on one of the resort’s four well-tended courts before they start baking in the sun; there’s also a basketball court, shuffleboard, and a somewhat neglected nine-hole mini-golf course on property. The main pool has a small "lazy river" segment and a waterfall built to resemble the ruined aqueduct in nearby Rose Hall; an adult-only pool on the west end of the property has the obligatory swim-up bar and outdoor hot tub (a harsh security light on one of the nearby hotel buildings rather ruins any romantic evening ambiance, however). The Sol Mer spa is located in a pretty corner of the property, a garden courtyard just off the main lobby. It’s small—no sauna, whirlpool, or even a private waiting room— but offers a respectable range of spa and salon services, including massage, wraps, facials, manicure/pedicure, and hair styling.